"N", "O", "P", "Q", "R", "S", "T", "U", "V", "W", "X", "Y", "Z"
Horsepower. The English unit of power equal to work done at the rate of 550 foot-pounds per second; equal to 746 watts of electrical power. Horseshoe Magnet. A permanent magnet or electromagnet bent into the shape of a horseshoe or having a U-shape to bring the two poles near each other. Host Card. An embedded computing term referring to a circuit board that supports a mezzanine card and which plugs into a backplane. Hot Carrier. A carrier, which may be either a hole or an electron, that has relatively high energy with respect to the carriers normally found in majority-carrier devices. Hot-Plug Slot. A chassis slot designed to allow the insertion and removal of add-in cards without powering down the Platform or restarting the operating system. A Hot-Plug controller is used to control signals on the bus's slot while the card is removed and replaced. Hot Spot. Localised zones of increased temperature. Hot Swap. The generic ability to remove and replace a component or piece of gear while it is still powered up with in a chassis. Commonly used to replace operational boards that have failed within a chassis. The cards have power and ground pins that are longer than the bus interface pins so the board is already powered by the time the interfacing pins make contact with the chassis. Hot-Wire Meter Movement. A meter movement that uses the expansion of a heated wire to move the pointer of a meter; measures dc or ac. H-Pad. An attenuator comprised of five components interconnected in the shape of an 'H'. HPIB. Hewlett-Packard Interface Bus. Another name for the GPIB interface, see also IEEE-488. HSSI. High Speed Serial Interface. The HSSI interface uses differential ECL lines to transmit data at 52Mbps out to a maximum distance of 50 feet, also EIA613. H-Type T-Junction. A waveguide junction in which the junction arm is parallel to the magnetic lines of force in the main waveguide. Hub. A multi-port device that acts as a switch or repeater connecting one incoming port to another. A device that accepts a signal from one point and redistributes it to one or more points. A Hub may be wired or wireless. A distribution point in a network. Hum. A low frequency sound composed of one or more frequency components. Normally low frequency noise generated from a 60Hz AC voltage or 120Hz DC power supply ripple voltage, or some harmonic of the AC voltage supply frequency. Hum is induced into a system from surrounding components or grounding problems. Human Machine Interface. [HMI] The user interface, or operator interface. A switch or display or some other interface that a user would use to control or monitor a machine or process. Also found as Man Machine Interface [MMI]. Humidity Indicator Card. [HIC] A card that changes color based on moisture level or relative humidity by the use of a moisture-sensitive chemical [cobalt(II) chloride, among others]. Reference JEDEC STD 033 for color accuracy. HICs are used when shipping or storing moisture sensitive articles. Also see [out-dated] MIL-I-8835 Indicator, Humidity Card, Chemically Impregnated. Hybrid. A functional unit in which two or more different technologies are combined to satisfy a given requirement. Hybrid Cable. An optical communications cable having two or more different types of optical fibers [single-mode and multimode fibers]. Hybrid Circuit. A circuit where passive components (resistors, capacitors) are deposited onto a substrate made of glass, ceramic, or other insulating material. Then the active components (diodes, transistors) are attached to the substrate and connected to the passive components on the substrate with a very fine wire. Hybrid Coil. Also called a Bridge Transformer. A transformer that has three winding but configured as four branches, or allowing four distinct loads. The primary use of a hybrid coil is to convert between 2-wire and 4-wire operation in concatenated sections of a communications circuit. Such conversion is necessary when repeaters are introduced in a 2-wire circuit. Hybrid ICs. Two or more integrated circuit types, or one or more integrated circuit types and discrete components on a single substrate. Also see hybrid microcircuit and hybrid circuit which have similar meanings to define the same topic. An IC might also be considered hybrid with two separate semiconductors or ICs attached to the same substrate, which would than be considered a single integrated circuit. Hybrid Junction. A waveguide junction that combines two or more basic T-junctions. Hybrid Microcircuit. A microcircuit consisting of elements that are a combination of the film microcircuit type [passive] and the semiconductor types [active] or a combination of one or both of the types with discrete parts. Hybrid Network. A communication network that uses more than one network topology. For additional information refer to the page covering Information network topologies. Hybrid Ring. A hybrid-waveguide junction that combines a series of E-type T-junctions in a ring configuration. When properly terminated, energy is transferred from any one branch into any two of the remaining three branches. A type of network topology. Hybrid Topology. Same as Hybrid Network. Hydrometer. An instrument used to measure specific gravity. In batteries hydrometers are used to indicate the state of charge by the specific gravity of the electrolyte. HyperTransport. A Point-to-Point interface with at least two unidirectional links. The HyperTransport data bus has a data rate of 800M Bytes/s using 8 bit pairs and a 400MHz clock. Hysteresis. The time lag of the magnetic flux in a magnetic material behind the magnetizing force producing it. Caused by the molecular friction of the molecules trying to align themselves with the magnetic force applied to the material. The property of a magnetic material which causes the magnetic induction for a given magnetizing force to depend on the previous conditions of magnetization. Hysteresis Loop. [B-H Loop]. 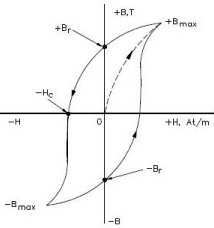 A Hysteresis loop showing the relationship between [B] Flex Density and [H] Magnetizing Force. Hysteresis Loss. The power loss in an iron-core transformer or other alternating-current device as a result of magnetic hysteresis. Hz. Hertz. A unit of frequency equal to one cycle per second.